I've been purchasing Scorp's minifigs and decals for years, but have been mostly keeping my collection to myself, aside from the occasional MOC or contest entry. After being inspired by the wonderful world of Wulfgard and Nightstalker's guide to army building, though, I figured it was past time I started showing off the fruits of my beloved labor. A lot of time has passed since I first gleefully opened an envelope with a red scorpion label and shakily put scissors to paper, but in a world of offices, bills, and deadlines, this hobby is still a much-needed source of joy. For my first entry in this journal of creation and recreation, I bring you not one, but two armies that I have mustered! They're rather small for now, for budget reasons, but I'm still quite happy with the way they are turning out. Hopefully you will feel the same way. 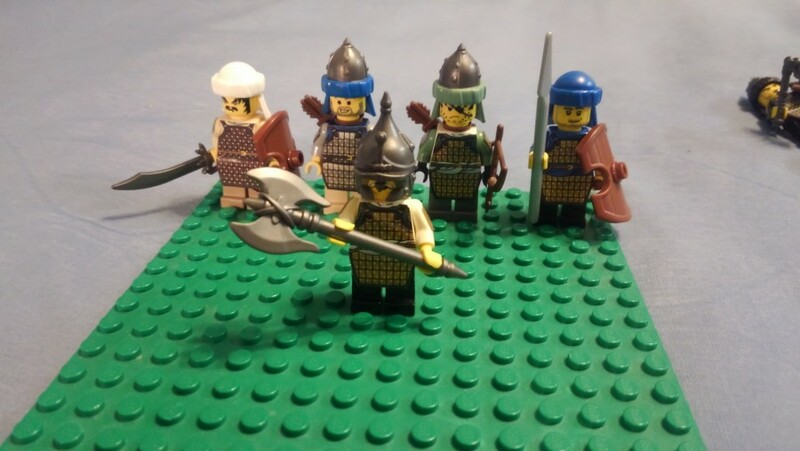 Say hello to The Veritshire Guard, and their ancient foes, The Golden Banner. 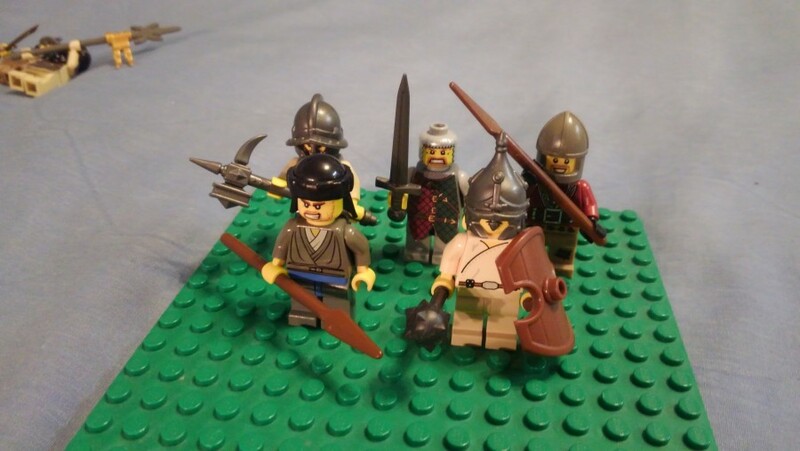 The former were first created as an NPC faction in a setting I created for Wulfgard's Errant RP, as the military and law enforcement arm of Veritshire, The Haven of the Crossroads. Conversely, The Golden Banner are the antagonists I touched on for my entry to the Earth contest; a force of ruthless bandits seeking to bring ruin upon the ascendant Imperials. After a squad of retired legionaries brought order to the seedy outpost of Veritshire, the surviving criminals retreated beyond the newly-reshaped borders, out of Imperial reach. They licked their wounds and longed for the power they had once held over the region, and their descendants would plot revenge against the upstart Achaeans, and the burgeoning little town of Veritshire. History no longer remembers the names of these vengeful conspirators, but scholars have grudgingly narrowed their arguments to two categories of leadership: the former, corrupt Parsanshari officials, and the criminals of various origin they allowed to roam freely. Their disregard for helpless Imperial citizens during their campaign of retribution was horrific in proportion. There was no small number of Deshreti tribesmen amongst the ranks of The Golden Banner, as well. Some were bribed, some were cajoled, and even more were related to the originators of this vendetta. All were eager to take part in raiding and pillaging the southern lands of the Empire. And, of course, there was no small portion of regular bandits, along with unscrupulous mercenaries (even of Imperial descent), all seeking their share of plunder. 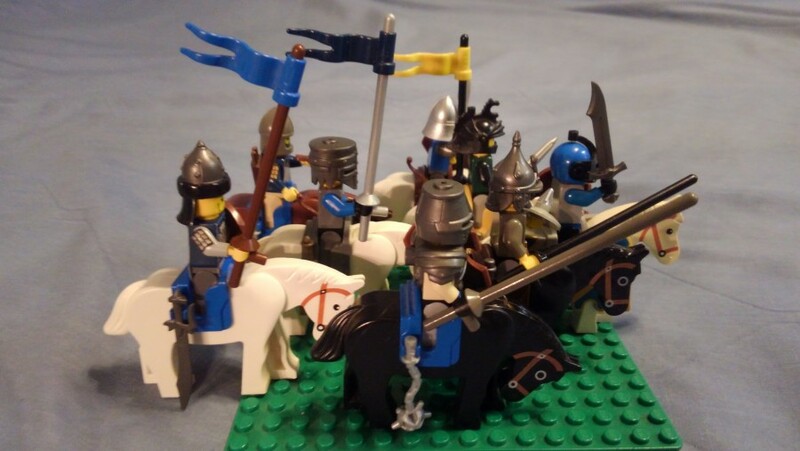 The Golden Banner wisely split their forces to avoid drawing the attention of the Legions, slipping across the border, past Fort Fire and any Imperial patrols so that they could safely regroup well into the Imperial heartland. A few arrogant columns were discovered and wiped out, but the majority of their force scattered through towns and villages, taking what they wanted and speeding away before any response could be mobilized. All converged on Veritshire, which would be their base of operations for striking at the Imperial heartland. However, the recently-ordained Baron of Veritshire had not been idle since gaining his position, and he had no intention of merely hiding behind his new walls. To defend what he and his comrades had built, Baron Onesta formed The Veritshire Guard, a town militia held to the same exacting standards as the Imperial Legions, but equipped for a more mobile form of warfare in the hot, wide southern plains. To that end, we begin by looking at the Sentries, Veritshire's first line of defense. While more lightly armored than the Legionaries they seek to emulate, they are quick and easy to redeploy, and much cheaper to equip and train. 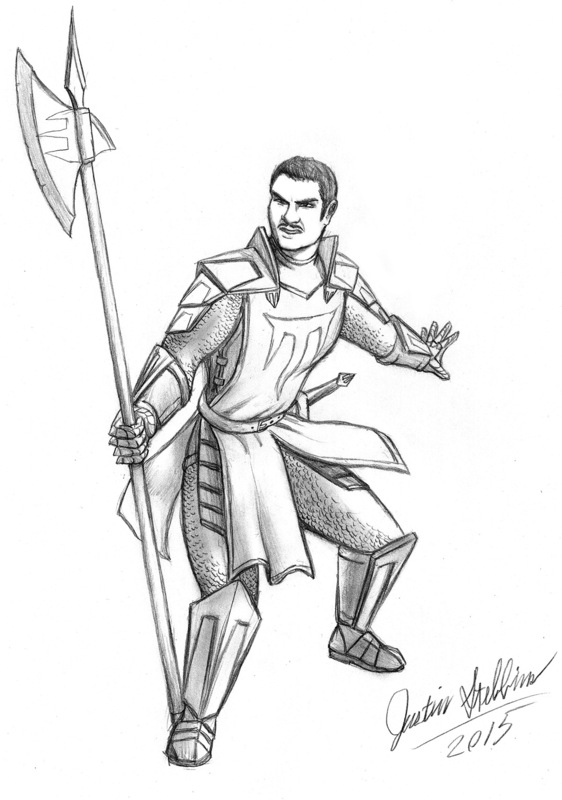 Sentries are issued a spear, shield, and gambeson, but expected to purchase any other arms or armor they wish to use. The Vigil are The Guard's ranged specialists, keeping a watchful eye on the town and its surroundings. The first Baron Onesta issued a decree that these soldiers must never be less than a hundred in number, so that his people would have sufficient protection in case of a siege. They are more than just passive observers, though, having developed early "fire and maneuver" tactics to thin the ranks of The Golden Banner. 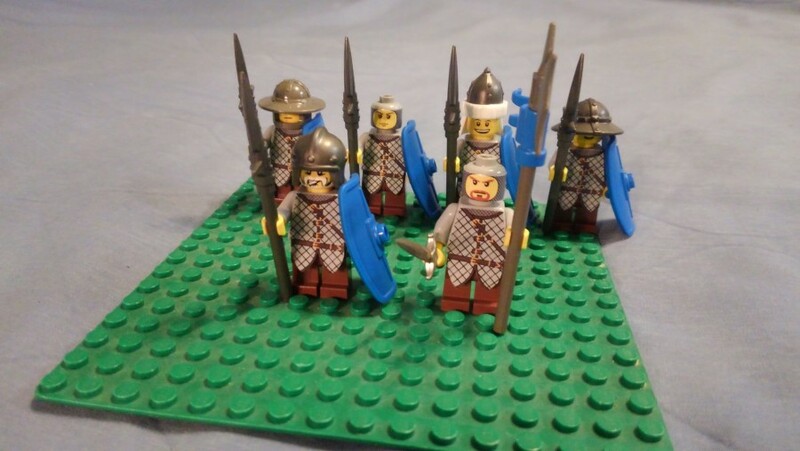 The Veritshire Guard's most prestigious members form The Triarii, always the oldest and most experienced soldiers in the force. They function as senior officers, elite shock troops, and the Baron's personal guard. 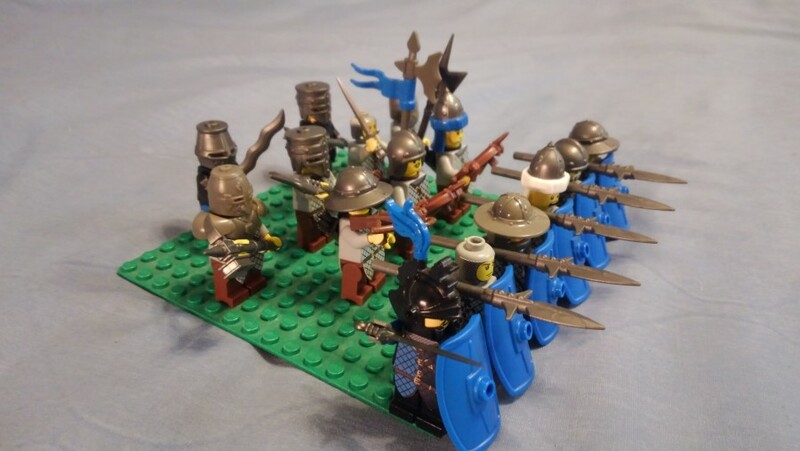 Their committal at critical moments repeatedly broke The Golden Banner's ranks, as these faceless men of iron shrugged off blows, slaying bandits left and right. In order to prevent other entities like The Golden Banner from wreaking havoc unopposed behind Imperial borders again, Baron Onesta created a new branch of his military: The Guardians. This rapid response force would hunt down any surviving renegades, and patrol the surrounding countryside almost constantly, protecting caravans, farms, and villages therein. To create this new force, Veritshire offered loot, armor, and weapons confiscated from The Golden Banner to anyone able to ride and willing to fight. 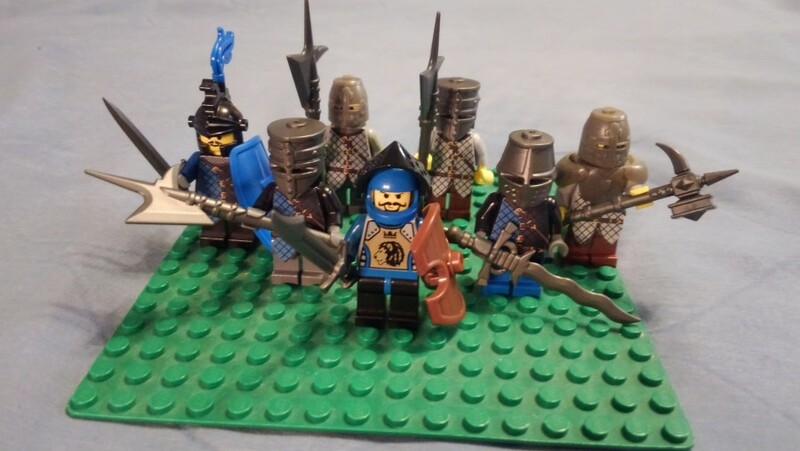 Mercenaries and Knights Errant looking to put down roots, retired Prodromoi and Cataphracti, and even reformed bandits looking to do some good could find a place amongst this elite brotherhood. These days, The Guardians are more limited in number to keep costs down, but the prerequisites to join are still rather loose. All applicants must own and be able to ride and maintain at least two horses, and have someone willing to vouch for their honor and ability to fight on horseback. Horse archers and light lancers are most prevalent, but knights are always welcome to serve. I hope you enjoyed this look into these two opposing forces! 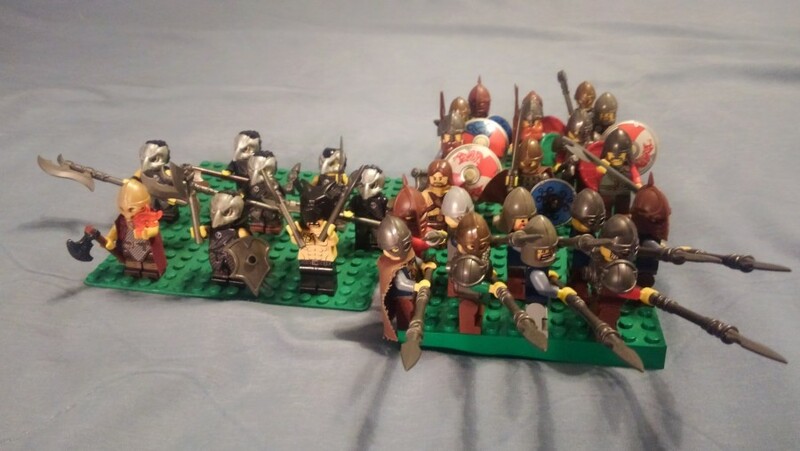 I might arrange them into a battle scene eventually, but don't have a baseplate large enough quite yet. If you noticed Southron arms and armor on the guardsmen, that's intentional. My headcanon was that Veritshire became Imperial territory during their early expansion into lands once held by Parsanshar, and intermarriage between the Imperial newcomers and Southron locals helped create the unique culture that forms the city in its current state. The descendants of the retired Legionaries and the Southron merchant families they married into proudly wear their Imperial citizenship, but mix it with the dress and customs of their neighbors into an identity of their own. Like Palmyra of our own ancient world, Veritshire bridges the gap between nations, standing proudly as a defender of commerce, learning, and culture. 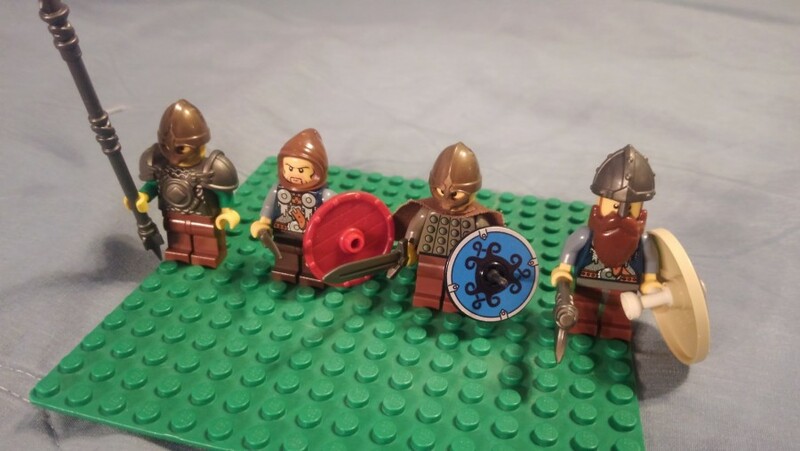 Stay tuned for even more Wulfgard minifigs! I currently have a force of Nordlings gathering (and drinking all my mead), and just need to round them out with my new Frost Ravens. Painting their helmets will be challenging, but I'm looking forward to it. And, if you've RP'd with me before, you know I have no shortage of Inquisitor characters just waiting to form ranks. 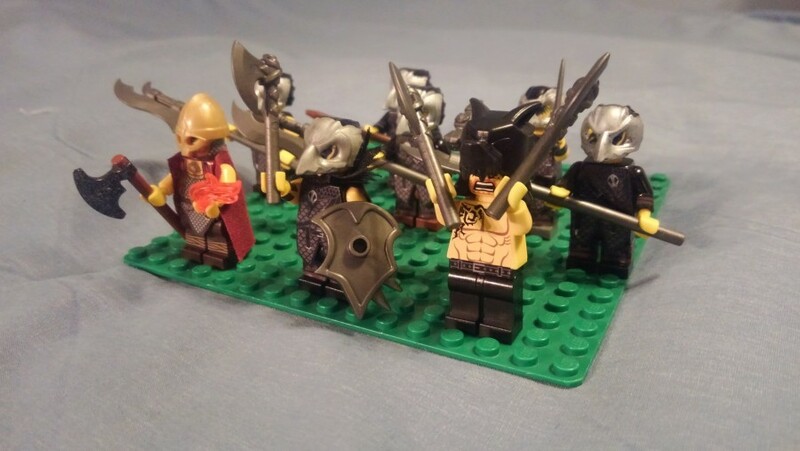 Heck, I have a whole drawer of minifigs I've assembled from Scorp's shop over the years, and eagerly hope to share them all with you, dear reader. Until then! Huge credit goes out to Scorp and Maverick for their work in Wulfgard and on these decals. 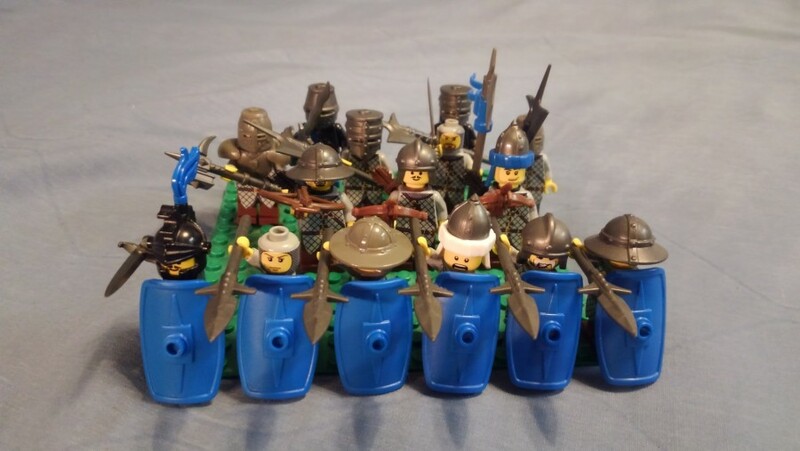 Arms and Armor were acquired separately from Brickwarriors, Brickforge, and Brickarms, along with my favorite Bricklink stores. The parts are too varied to list in full, but if there's something you haven't seen before, feel free to ask, and I'll try to remember where I got it from. I really love the overally design for the Golden Banner. Between the mix of decals, BW equipment, and BF equipment, you've created a really awesome group of lamellar wearing bad@$$3$! I do like how varied each army is, even among the different 'units'. Gives the realistic vibe of who has more money and preferences to armor and weapons. This is some really good stuff you've got here Cappy! 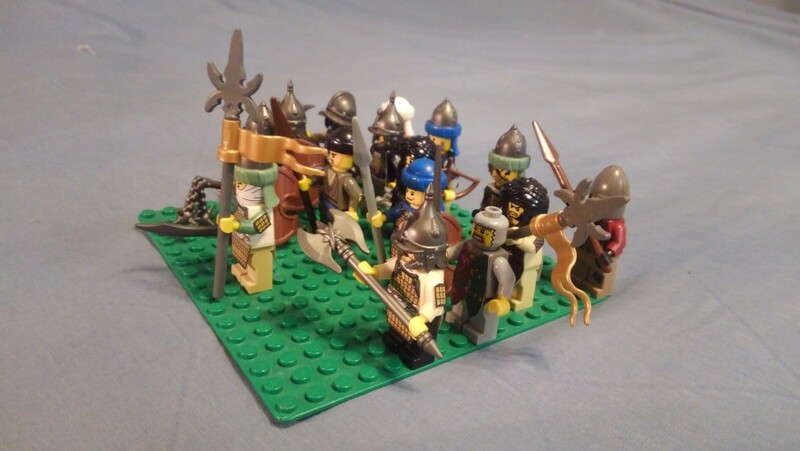 I especially like Vertishire Guard in the Black Dragon helmet, and the Grimm III cameo in the Golden Banner. Thank you so much! The shoulderpad decals were particularly annoying to trim, especially when they kept falling amongst the other paper trimmings, lol. I'm glad you like how they turned out. I was experimenting with various looks for the Southron civilizations of Wulfgard, and figured Scorp's Assassin's Creed lamellars would be the best fit for their warriors. I'm so happy you noticed! Playing around with a uniform appearance but non-standard weapons and units was an exciting challenge. 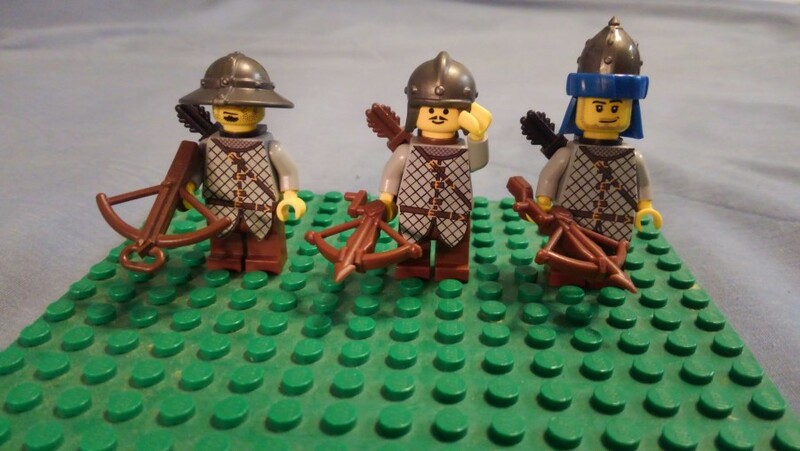 I might add some regular archers to The Vigil eventually, and I definitely plan to keep expanding my Veritshire Guard minifigs as I go. Thank you, there will definitely be more. You're still misspelling "Veritshire," lol, but I'm glad you found a favorite. 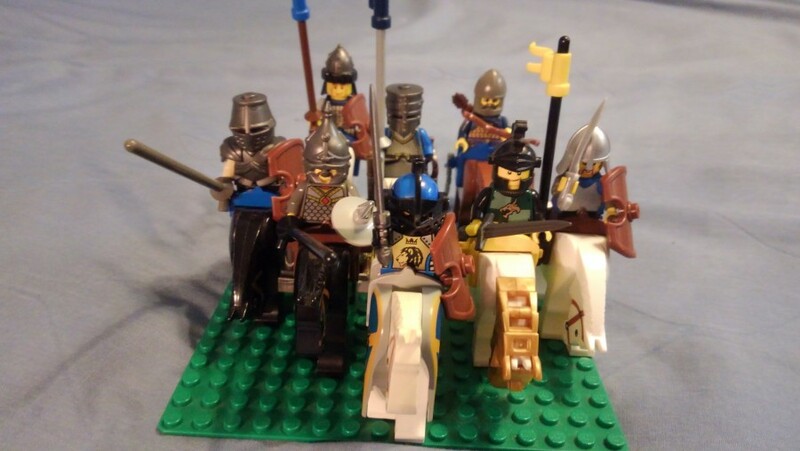 The Guardians are where I was able to break the mold and just have fun with the craziest choices, figuring the knights, mercenaries, and reformed bandits would bring the most eclectic collection. While I mentioned on Discord that I planned to be painting Frost Raven helmets this weekend, I kept the rest of the army close to my proverbial vest. As you can see, there were quite a few of them. Please ignore my ratty old covers and the organizer I forgot to crop out, I just wanted to get reeeeaaaally close to those pikes. 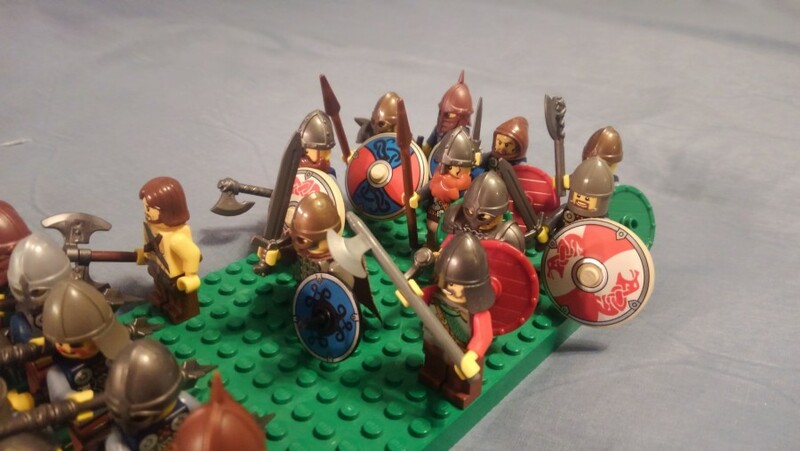 While I knew my Nordling army would inevitably include some stereotypical Viking-style axes and shields, I also wanted to try my hand at the Geatling pikemen that Scorp mentioned in "Wake Not the Sleeping Bull." The Northmen adapting their tactics and weaponry to counter Imperial knights fascinated me greatly. Oh, and speaking of Stebbins short stories, look who tagged along there, in the center left! If you haven't bought their collection already, I highly recommend that you do. These are my "specialists," aka the minifigs I couldn't fit on the other baseplate. Frederik the Burning Viking and the Frost Raven with an actual cape were both Patreon rewards, while the rest were assembled by me. The berserker's decal probably came from something else, but I needed a shirtless decal to go with the wolfskin headpiece, and I forgot to order that decal separately. Hopefully you'll also think that it looks cool. 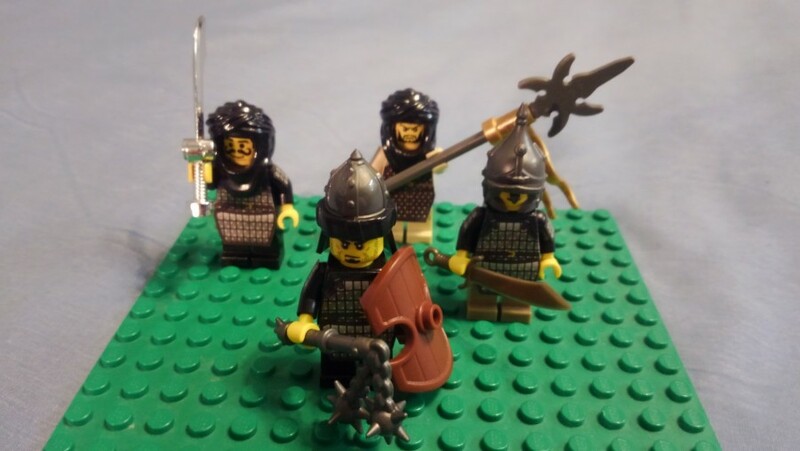 I'm still not quite sure about my choice for the BrickWarriors bardiches for the Frost Ravens' halberds, but neither BW nor the regular Lego halberds quite fit the official images, either. Also, rear view of the Patreon Frost Raven to show off his custom cape. 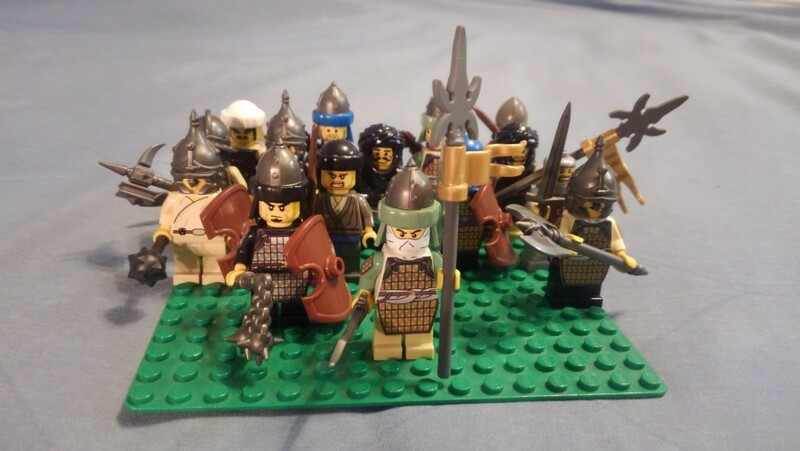 Here we have a closer view of some of the more unique Northern warriors from my formation. 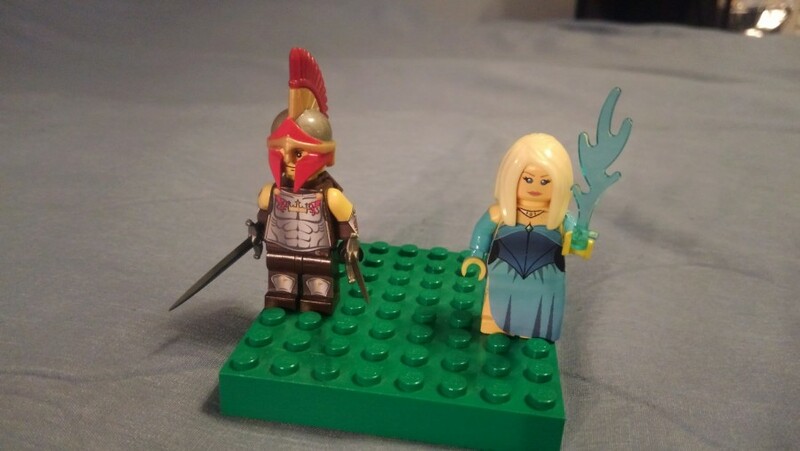 While I was in a painting mood, I also assembled my very own Princess Adrianya minifig! Finding her hairpiece wasn't nearly as frustrating as getting the paint on her arms and hands to cooperate, but she still looks quite pretty. I didn't paint the armored duckling Sir Tom to the left, I just wanted to show him off, since he's been in my collection since the Kickstarter. 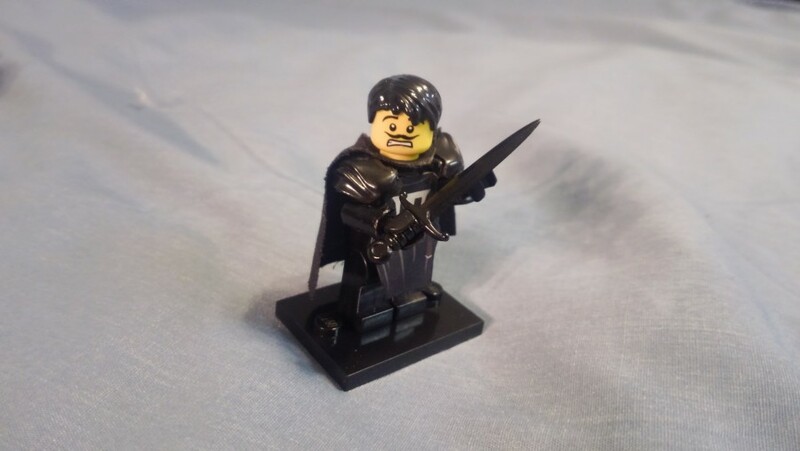 Another minifig that's been in my collection a while is my Wulfgard sigfig: Inquisitor Marcus Capulet! Sans helmet and halberd, with a bewildered expression on his face. Anyone who's RP'd with me in Errant knows this is pretty much Marcus' default expression nowadays. 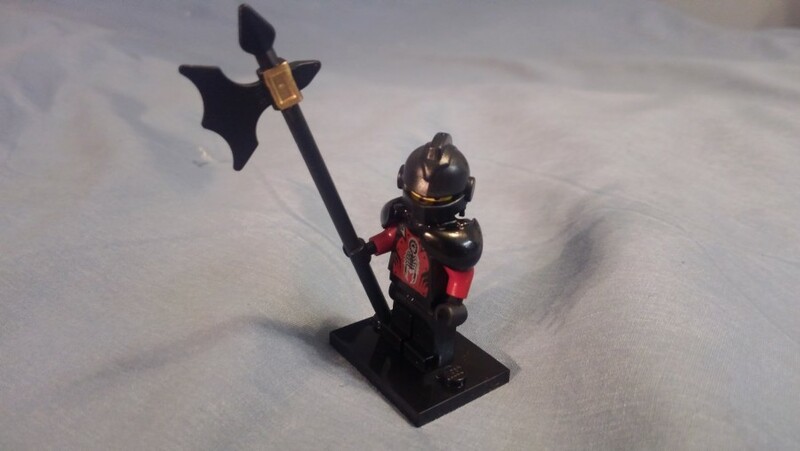 While I was in a painting mood, I ended up idly thinking to myself, "Hey, if I was a Moderator during the SYWBAA days, what would my Skorpiontowne Guard minifig look like?" This was the result. There was a gold paint pen in the pack with the silver pen I got for the Frost Ravens, and I had no intention of letting it go to waste. A poor attempt at the "Spiderman Points at Spiderman" meme, because I am a nerd. Another ragtag army, but a good ragtag army. 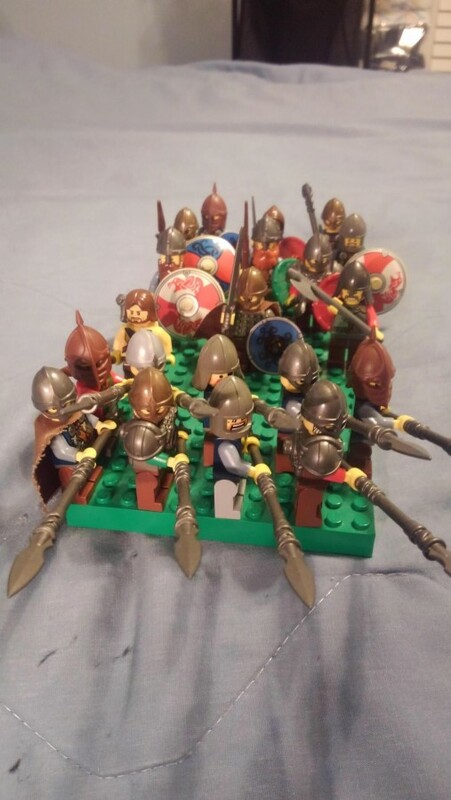 I forget how varied armies are at times. I've always liked the Storm Trooper approach of everyone being the same. The scalemail looks really good on the Frost Ravens, and you did great on the paint with Princess Adrianya! Marcus looks dope as all get. I also enjoy the throwback to Skorpiontowne! 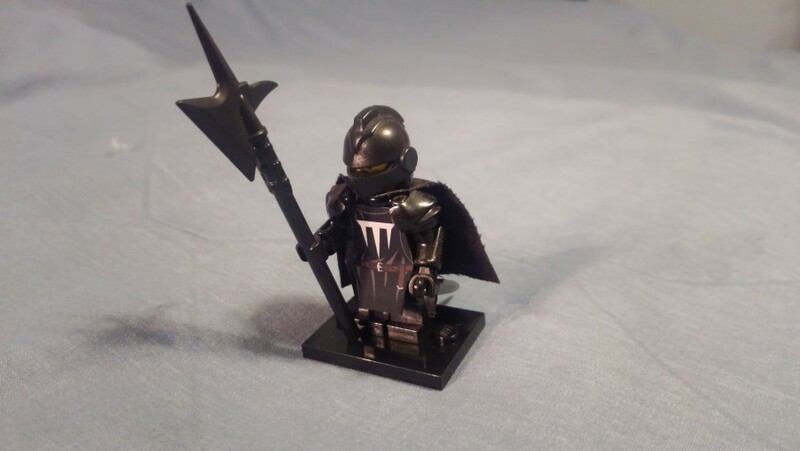 Between you and Nightstalker, I feel a bigger need to commission Scorp for Lego or art. Nice Update! 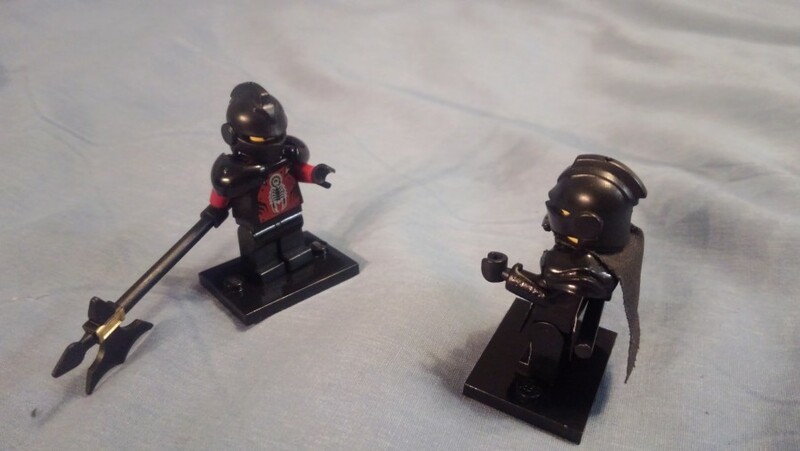 The Marcus figs are my favorite that you've done so far! 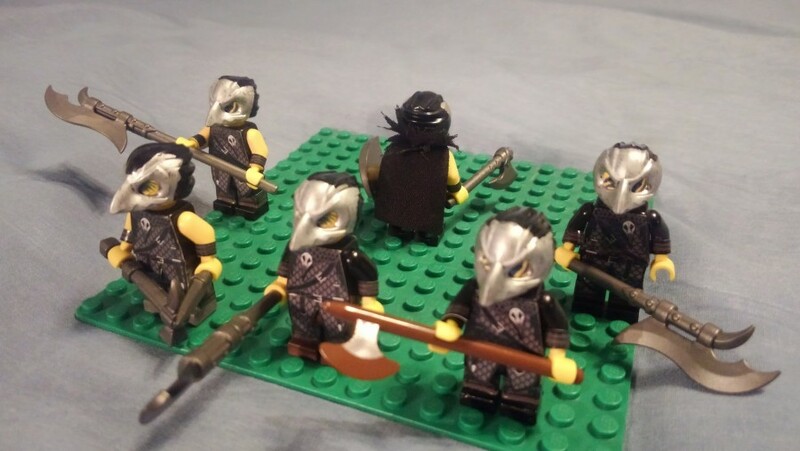 Awesome group of Nords and Frost Raven! Your sigfig is also really cool! I'll be buying parts for the new Wulfgard Imperial Legionaries eventually, those are much more uniform. But outside of the more regimented armies like that, yes, it's quite fun to work with more varied armies. Doesn't it? Scorp and Mav are rightly proud of how that design turned out. Thank you! Your feedback brings joy to my heart. 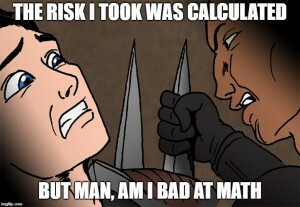 Aah, I was wondering about that! I was frantically digging through my Patreon envelopes to find something like that, so I'm glad you included it. Thanks, Nightstalker! Back when I started RP'ing Marcus, I hadn't nailed down much about his actual looks; but when Scorp and Mav's kickstarter came up, I gave Scorp some vague instructions, and he came up with the awesome sketch here. Then, I just ran with whatever Lego accessories would best go with the basic Inquisitor decal, and this was the result! It took lot of custom painting since Brickforge was having stock issues even back then, but I'm quite happy with the results. Thank you! As mentioned above, the WG one was a labor of love, and the SYWBAA one was also quite fun to design. You should, I've found it quite therapeutic. For the next update, I'll probably just take pictures of more minifigs I've already assembled, but have kept lying in my drawer. Or drawers. And a box or two. Wulfgard may be my current favorite universe/Stebbins franchise, but it's not the only set of decals I've purchased, as you'll soon see.